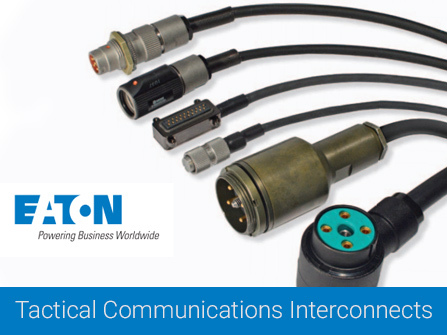 March Electronics carries the full range of Eaton Tactical Communications Connectors and Interconnect products. 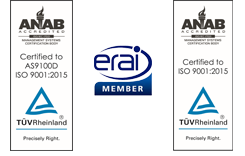 These connectors are universally used in communications equipment where the highest reliability is needed under the most severe environmental conditions. The standard 5-contact connectors meet all requirements of MIL-C-55116, latest revision. 6-contact connectors as well as the light-weight versions are designed to meet all performance requirements of MIL-C-55116. Mating is accomplished quickly with a twist-lock motion. Non-rigid contacts are spring loaded and provide positive electrical connection with minimum voltage drop. The 10-contact connectors conform to MIL-C-10544, latest revision. Construction and mating action are similar to the 5-contact line. Years of successful field experience have proven the remarkable reliability of this line of connectors for all types of military and commercial communications equipment. The UW connectors meet all requirements of MIL-C-12520 for the latest revision. These connectors are rugged, proven reliable, and are designed for power and control interconnections. Featured is a center-locking, double-lead screw for maximum reliability, with a fold-down, wing-blade handle. They are waterproof and can withstand the extreme range of environmental conditions encountered by ground support equipment. The MW connectors meet all requirements of MIL-C-55181 for the latest revision. These connectors are similar in construction to the UW series, but provide greater contact density in the 18-pin configuration. These are used exclusively in the U.S. Army’s VRC-12 communication system, as well as other applications.